Pay attention to who your dog is, not who you want them to be. As we sit smack in the middle of outdoor patio season, let’s pause to take a moment to think about our dogs. We love sitting on the patio with our friends, meeting new people and socializing for a few few hours (we especially love coming to the Save-a-Bull brew tour events!) But how does your dog feel about that? While we promote dog-friendly events, and encourage you to bring your dog, if he enjoys such things, please take a moment to consider if he actually wants to be there. The following is an excerpt from an article by Jill Kessler; it’s an oldie but a goodie. The author talks about her disdain for dog parks and why. We see many similar correlations in overcrowded, loud, fun-for-us patios. Be sure your dog loves this chaos as much as you do, as controlled experiences are key training opportunities for your dog. I am not a Dog Park advocate. …let’s look at [dog parks, patios] from a dog’s point of view. Dogs thrive on stable relationships. Notice I did not say “pack!” They set up and like to maintain relationships with things that they know: their people, our human friends, their dog friends, their housemates, etc. Unless there are the exact same dogs every time they go to the dog park (which is nearly impossible), they have to re-establish their relationships with not only the dogs they already know in context of the new dog present, but they also have to establish a relationship with that specific new dog. Some dogs can handle the stress of this–but most cannot. Thus you’ll get what appears to be random fighting, random aggression towards a dog they know, random odd behaviors (“gee, never done that before”), seemingly sudden guarding behaviors (territory, owner, another dog) etc. It’s not random or unpredictable–it’s the stress you, as an owner, causes by going to the dog park! Dog parks require skills that most dogs do not possess, nor would they according to how we have bred them for hundreds of years. Lastly, I’m very wary of the “unknown” factors. Unknown dogs, unknown owners, unknown relationships and interactions, unknown damages. I don’t like surprises, and dog parks hold way too many unknown factors for dogs’ safety. One of my main reasons for not being a dog park advocate is what I can’t control my dog’s experience and/or other people’s dogs (and I think it goes without saying, the dog owners). Because dogs are learning all the time, I must control as much of their experiences as possible, so that they build a solid foundation of behaviors that are appropriate and desirable, such as impulse control, bite inhabitation, and exchanging rewarding, affiliative, positive social interactions. All mammals remember frightening encounters over non-eventful or even fun encounters. It’s a primal survival brain mechanism, designed to keep us alive. Dozens of positive encounters can be overridden by one bad one; thus I must make sure my dog has only positive experiences for several years, until they are mature and have a solid foundation before I expose them to a possibly unsure environment. If your dog gets bullied, attacked, frightened or even just overwhelmed at the dog park, he will bring that experience and the subsequent conclusions he made with him everywhere. The reactions can vary from “I’m scared and must get away as quickly as possible at all costs” to “If I come on strong and attack first, maybe I’ll be okay,” to just about anything in between. Also keep in mind that fighting and bullying in dogs is a learned behavior just as much as anything else, and therefore once your dog does it a few times, it’s now learned and bound to be repeated over and over again. And make no mistake–many dogs enjoy being a jerk! Your best bet is to not let it start in the first place, whether it’s your dog being the bully or being the target. Of course I recommend dog-to-dog play! If your dog has a few friends that he or she really enjoys, please go for it! Set up play dates, meet somewhere where they can safely run, sprint, wrassle, and jump about. Since dogs generally play in pairs, try for either just the two, or in even numbers, you’ll find it works out better. Some dogs only want or need a few friends (just like people), and some are social butterflies, and can make friends wherever they go. Pay attention to who your dog is, not who you want them to be. Stay within your dog’s comfort zone, and you’ll have a happier, safer dog. Spay/neuter programs for dogs is a big part of contributing to healthier communities. Not only are dogs who are spayed or neutered physically healthier than those that are not, they also tend to be less aggressive and have less urge to roam away from home which keeps them safe and out of harm’s way. Another aspect to healthy dogs & healthier communities is in how we live with and how we treat the dogs and other animals around us. And the best way to spread that information is through the bright young minds of the children living in these communities! Save-a-Bull volunteers, and their dogs, are often asked to speak with groups about a variety of dog-related topics. With younger kids, we address basic dog safety. This summer, we visited with a group of first graders from Golden Valley Summer School and a Minneapolis Girl Scout Troup. We talked about the proper way to greet a strange dog and how to react when a loose dog approaches them, and the kids practice both scenarios with our dogs. Some were scared at first, some were overzealous, but they all left with the proper knowledge and new skills to smartly and safely interact with dogs in their neighborhoods. For older groups of kids, like the charter school in Brooklyn Center last year, we talked about pit bulls in general: myths and facts, breed discrimination, responsible ownership and dog fighting. The kids were incredibly open and interested in the more serious side of dog-related issues. We also talked about what rescue really means, breeding, how we work with animal control, volunteering opportunities, and more. The great thing about opening a kid’s eyes to something new, is that they then go out and share their newfound knowledge with others! There’s no way of knowing how much impact that child will have on the people around him – but it’s an amazing thing to consider! We have many Save-a-Bull ambassador dogs who, along with a representative of the rescue, will be prepped and ready to come and talk to classrooms, youth groups, scout troups, community centers and more. Education along with Q&A and interaction with the dogs will help inform and excite kids about being a proactive and positive role model for animals. Handouts materials from these sessions can be taken home to further share the education with their families. Teachers and youth leaders will be able to request workshops that best fit the needs of their groups and everyone will have fun learning, teaching and building better communities – together! We’re very excited about this new part of our Healthy Dogs Healthier Communities initiative and hope you’ll continue to support our mission AND call on us to come and speak to your kids soon. Watch for the program to officially launch in early 2017. Thanks to you, Save-a-Bull has had the opportunity to rescue and rehome a lot of deserving dogs this year. But that’s not enough! Supporting spay and neuter assistance programs for our community will promote responsible dog ownership and breed advocacy which is an important part of the work we’re trying to do every day. Donate today and be a part of our Fix Your Pit program! Dogs need “occupational therapy.” So says Dr. Ian Dunbar, DVM, animal behaviorist and puppy guru. If you don’t give your dog something to do, your dog will find something to do. How Can I Teach My Dog To Stop Nipping? If your dog is tense when she nips at you or bares her teeth, this might be a sign that the behavior is less than friendly. Enlist the help of a certified trainer to help you the behavior can easily get out of control. Leash lunging, leash reactivity and leash aggression are all behaviors that are caused by a dog feeling restrained, frustrated and uncomfortable in a social situation while attached to a leash. In normal circumstances, an unleashed dog would be able to put sufficient distance between himself and a fear source. But if the same dog is leashed and unable to increase that distance, he will react or behave defensively in the hope that the fear source will go away. If your dog’s behavior is reinforced by success (meaning distance has been increased), he is likely to react in the same manner again when faced with a similar stimulus. Walking a dog that lunges and aggresses on leash is not a pleasant experience. The anticipation of a problem tends to cause human tension, which is transmitted down the leash to the dog, effectively making the lunging behavior worse. Dog and owner are then locked in a vicious cycle of tension and leash lunging that becomes hard to change. How Do I Train My Leash Reactive Dog? The first step to stopping your dog lunging is first identifying the cause of his discomfort, and then working to desensitize him to the stimulus that makes him uncomfortable. At the same time, you will be conditioning him to see that the stimulus is no longer cause for concern. If you have a dog that is social, and who lunges on a lead because he is frustrated and just wants to get to the stimulus, you have to teach him that lunging achieves nothing, while calm behavior results in him being able to greet. If you have a social, yet frustrated dog, simply turn and walk him away from the source until he is calm and only allow him to greet when the leash is loose. Do not punish a dog that lunges on the leash for any reason, especially if the cause of the behavior is insecurity, which is the case for most dogs. Put the emphasis on giving your dog something else to do in that moment instead of using punishment, which will help him be more comfortable in the situation. By using positive reinforcement techniques you can actually change the way your dog feels about a certain situation for the better and therefore change his emotional and behavioral response. For example, when your dog sees another dog in the distance and is curious but not yet uncomfortable, bring out his favorite toy or food and play with him or feed him. The toys or food you use have to be of the highest value and only used when doing this teaching around other dogs. Playing or feeding your dog will help him to not only focus on something else when he is in the proximity of another dog, but the pleasure he gets playing or eating will change the way he perceives the outcome of that dog’s presence. Now he is associating the sight of another dog with positive things happening to him that make him feel good. 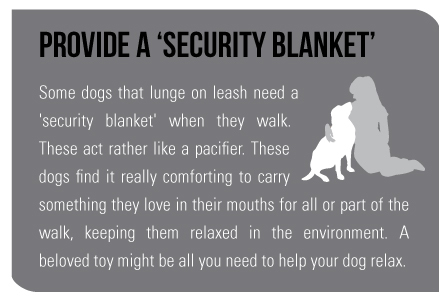 This is the key to changing the way your dog feels. 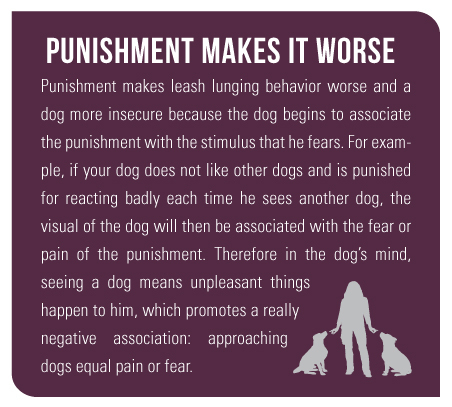 Remember, punishment serves to suppress behavior at that moment, but does not help to change the way a dog feels emotionally, while using these positive techniques will have longer lasting success. Desensitizing your dog to a perceived threat, such as an approaching dog, may happen very quickly, or it might take a period of time. Every dog is different and it is important to go at your dog’s pace. To teach your dog to be comfortable with other dogs passing by, start by having a friend or trainer bring their calm, non-reactive dog to help you. Begin the training by having them stand at a distance where your dog is comfortable and can focus on other things. Play a game your dog enjoys, give him his favorite toy or feed him some delicious food. If your dog shows no signs of discomfort, ask your helper to bring their dog a little closer. Continue to play or feed your dog and give plenty of praise. If at any time your dog reacts negatively, simply turn around and walk away from the situation until he calms down enough to play again or accept food. If your dog is reacting negatively, you have decreased the distance too quickly. Move the helper dog back to a distance where your dog can relax and repeat the process. Training might take time depending on your dog’s level of discomfort, but do not give up, as this training technique has an impressive success rate. Stay calm and relaxed yourself throughout the process and gradually work up to the point where the other dog is able to walk past as your dog focuses on you or stays calmly by your side. When you get to the point where you can walk past other dogs with no reaction at all, your dog might be ready to experience his first greeting. Do not allow unconfident dogs to greet face to face to begin with as it can be too much pressure, so practice following the other dog or walking parallel with each other until both dogs are comfortable. If your dog is relaxed, then you can both walk in an arc towards each other, have your dogs greet for a few seconds face to face and then happily draw them away from each other, rewarding them for making this huge step. When it is appropriate, try going for regular walks with your dog’s new friend and begin adding other dogs to the mix until you can get a regular walking group together. Simply experiencing the joys of a walk with other dogs will help your dog feel more comfortable around them. 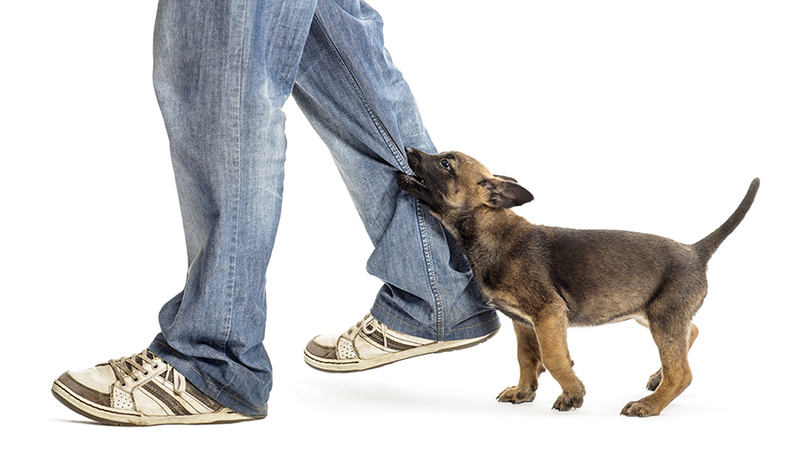 Like most aggressive responses, leash aggression is usually rooted in a dog’s fear of a person, place or thing. To manage the behavior, you must first identify what is causing the fear, and then work to desensitize the dog to that fear by utilizing positive training methods. Never punish a leash aggressive dog with leash jerks or physical force, as this will only increase the dog’s fear and lack of confidence in that situation. Successfully managing leash aggression can take time, but as long as you stay consistent and provide positive alternatives to how the dog experiences things, you can literally change how the dog feels about being on the leash.